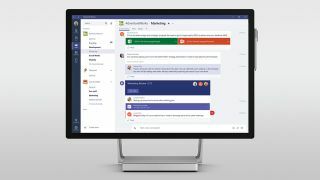 Over at the firm’s big Ignite conference in Orlando, Microsoft has announced that Microsoft Teams will replace Skype for Business. Yes, it would appear that Microsoft wants to make Teams a one-stop-shop in Office 365 for all your meeting and conferencing needs, and in the coming months the firm notes that Teams will be getting a raft of features including making inbound and outbound calls to PSTN numbers, call transfers and voicemail. Teams meetings now have audio conferencing capabilities (at least in preview) so you can join a meeting simply by dialling a phone number, and Microsoft is promising interoperability between Teams and Skype for Business, “including universal presence, and messaging and calling interoperability”. For those who don’t wish to move to Teams, or who aren’t ready to migrate their systems yet, Microsoft will apparently make a new Skype for Business server available in the second half of next year. Also at Ignite, Lenovo has been showing off its new ThinkSmart Hub 500, a Skype Room Systems device designed in conjunction with Microsoft to help conduct meetings with local and remote participants, all with a minimum of fuss.